I’ve seen several recipes for these on Pinterest, and even though they looked good, I resisted initially because it called for a couple of ingredients I didn’t have. Well one of my friends at work has made them several times now, and I tasted hers one day and they were so good. So I decided to go for it, and this is definitely a recipe I’ll be making over and over again. First of all, they’re so scrumptious, I could eat my weight in them. 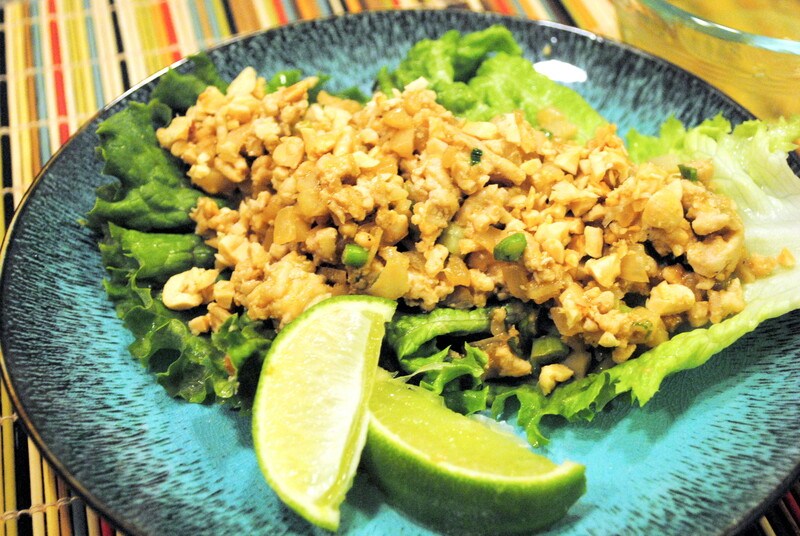 Second, they are really very healthy, especially if you use ground turkey breast, which is 97% lean. Third, they come together in no time at all, around 30 minutes total, so they would be a great weeknight meal. I made these for dinner when Tim had a gig and my mom was in town helping me work on some sewing projects for the nursery (by “helping” I mean doing, since I don’t sew and she does). We both agreed the lettuce wraps were extremely flavorful and satisfying, yet light at the same time. 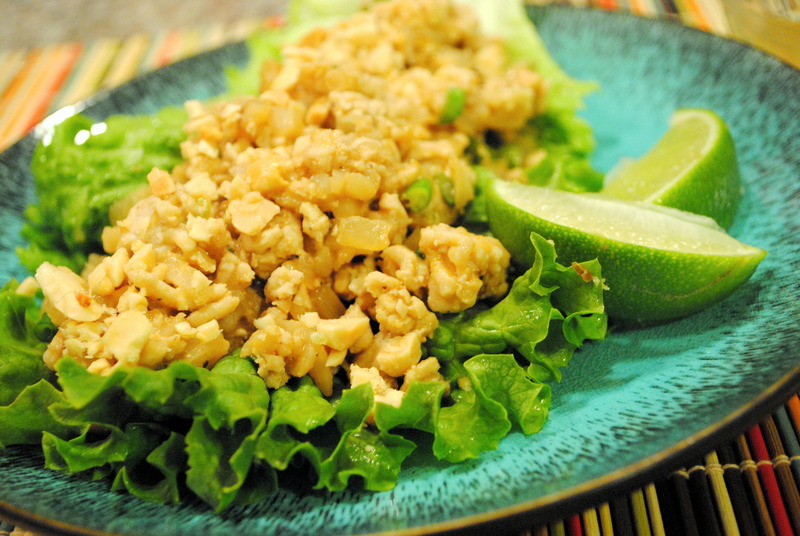 The filling is a tangy, sweet, and spicy ground turkey and vegetable mixture with just a hint of peanut butter and it’s all topped off with bits of peanuts and simple lime agave sauce. When you eat them, first you get the sweet citrus taste, then the savoriness of the peanut butter and sesame oil, and finally that little bit of heat from the sriracha, all surrounded by the cool crispness of the lettuce leaf. The elements of this dish just all blend together so harmoniously, nothing really overwhelms. The recipe I went off of didn’t have the lime sauce – that was our own little creation to add a little citrus and sweetness, and I would highly recommend it. It was beyond tasty, easy, and a wonderful compliment to the dish. Heat olive oil in a nonstick skillet over medium high heat. Add turkey and onions, and salt and pepper to taste. Cook for 3-4 minutes and add garlic. Cook until turkey is no longer pink and onions are tender. 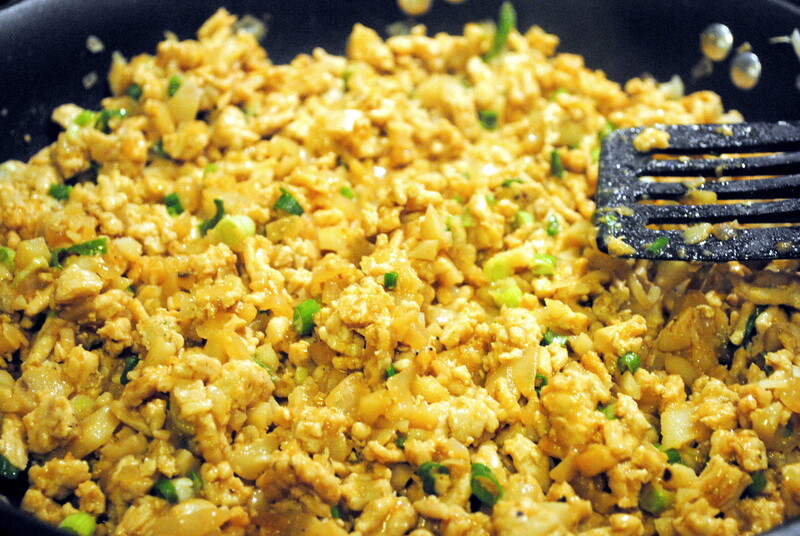 In a microwave safe bowl, mix together sesame oil, soy sauce, water, peanut butter, honey, vinegar, and chili sauce. Microwave for 30 seconds and whisk until well blended. Add to the cooked turkey mixture. Stir in the green onions and water chest nuts. In a small bowl, whisk together the agave and lime juice. 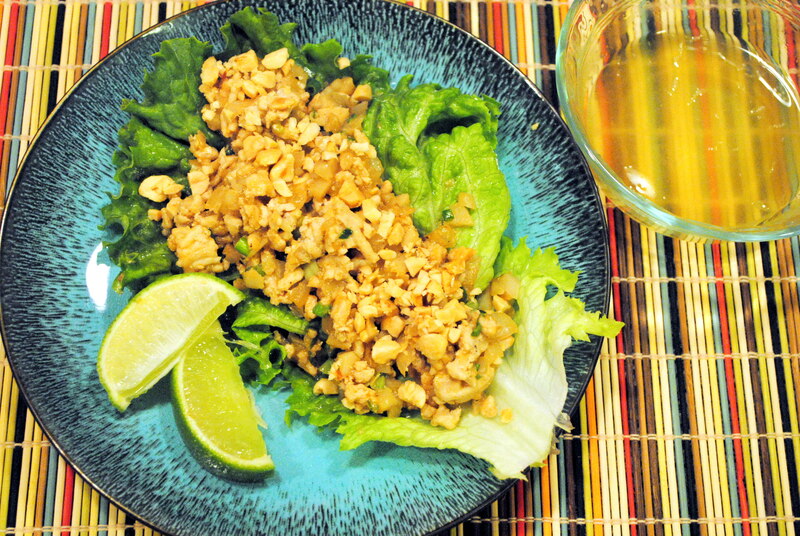 Serve turkey mixture in a lettuce leaf, top with chopped peanuts, and drizzle with agave lime sauce. Repeat. ← Decadent Peanut Butter Swirl Brownies. Did I Mention They’re Skinny?